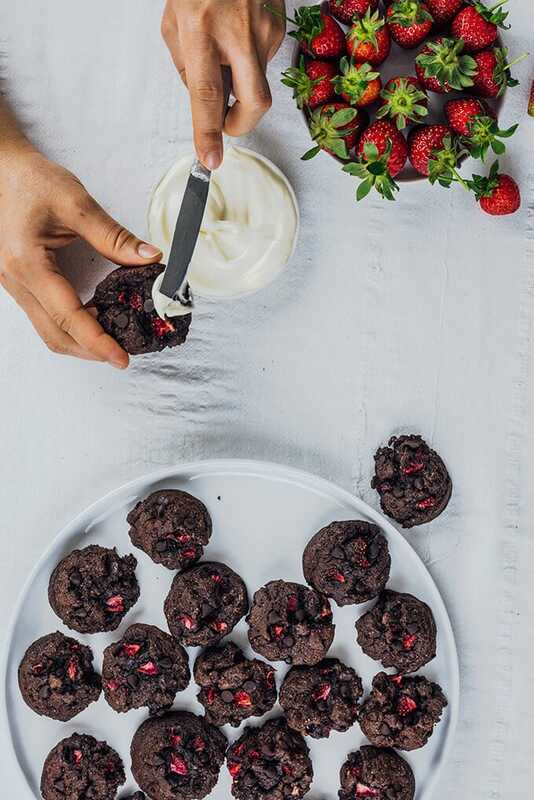 Strawberry Chocolate Cookies loaded with fresh strawberries and chocolate chips are game changers. They are wonderfully chewy and stay soft. I’ve always had a love affair with strawberries. I’m the happiest person on this planet when the strawberry season arrives every year. I go back to my childhood when I used to eat LOTS of strawberries right from my parents’ backyard. They are still the most scentful strawberries I’ve ever eaten. That’s why these strawberry chocolate cookies have the same big effect on me. I remember my childhood memories in each bite. It’s not the first time I’m combining strawberry and chocolate. As I think they make the best and most passionate couple ever, I’ve made recipes using these two before such as Chocolate Strawberry Tartlets or Strawberry Chocolate Cake. These are loved so much by my family and friends, so I’m %100 sure that these cookies will become their favorite cookies (besides Molten Chocolate Citrus Cookies). 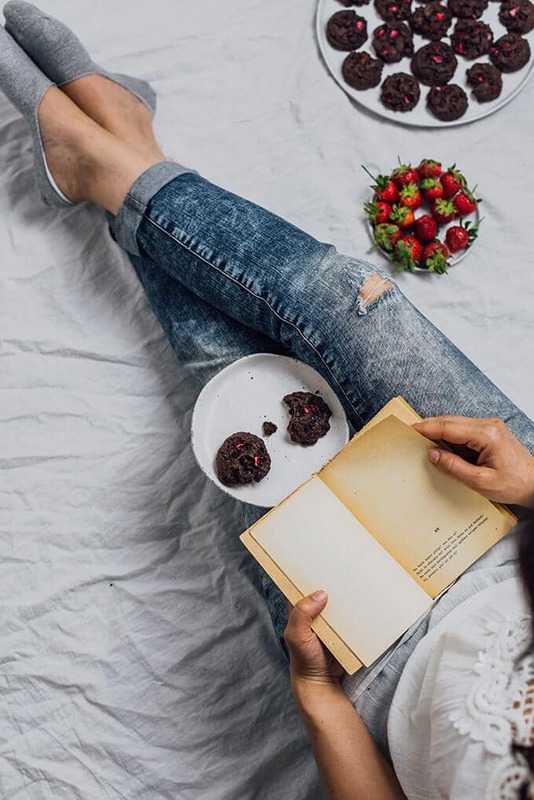 Although it’s a well-known fact that chocolate and strawberries match wonderfully, I couldn’t find a strawberry chocolate cookies recipe on the web. To my surprise, nobody has tried to make such a recipe. Could that be because fresh strawberries easily get juicy when baked? They might cause the cookies to become soggy. Read the note below to learn how to avoid soggy cookies when you use fresh strawberries in a cookie dough. 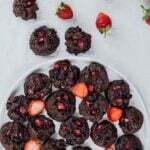 Well, I came accross with a Chocolate Strawberry Brownie Cookies recipe, but it is vegan and gluten-free, not something I was looking for. On the other hand, the other recipes I’ve seen either call for strawberry cake mix or use strawberries but not in a chocolate cookie form. I wasn’t after these either. 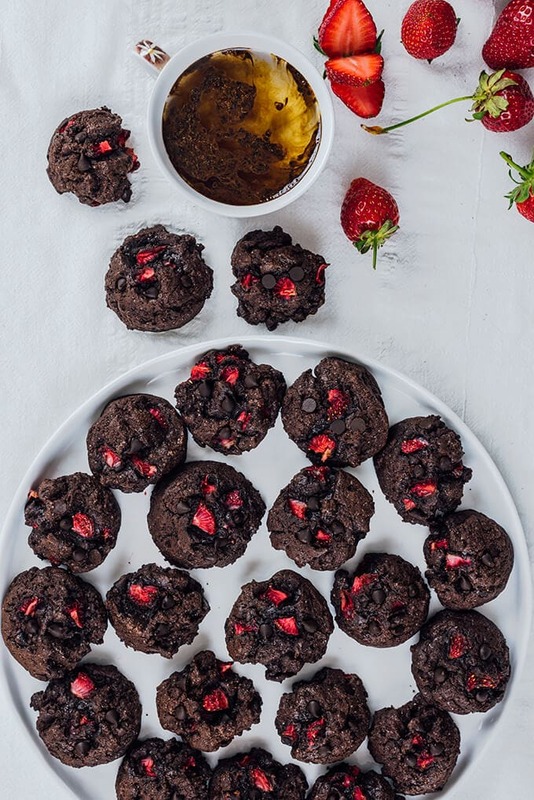 I wanted to make regular chocolate cookies packed with chocolate chips and fresh strawberries. Sort of triple joy. To avoid sogginess in your cookies, you need to pat dry the strawberries with a paper towel after they are chopped. This is a vital step in this recipe. Otherwise you might end up with a result you never desire. Store these cookies in the refrigerator after the first day because they might go off due to the fresh strawberries inside. Don’t store these cookies in an air tight container, cover them using a plastic wrap with a small opening so that they don’t get too soft. Double chocolate cookie loaded with strawberries and chocolate chips. A true love story. Place chopped strawberries on a piece of paper towel, cover them with another piece and pat them dry. Let them sit there while you are making the dough. Preheat oven to 370F (190C). Line two baking sheets with parchment paper and set aside. In a large bowl, cream together the butter, sugar and vanilla extract until combined. Add in the flour mixture and mix with a spatula just until combined. Don’t overmix. Stir in chocolate chips and pat dried chopped srawberries. Don’t overmix, otherwise your dough becomes soggy. Refrigerate the dough for 30 minutes. Using an ice cream scoop, place cookies on the prepared baking sheets. You can place extra strawberry pieces on each if you like. Let them cool for 5 minutes on the baking sheet. Meanwhile place extra chocolate chips on each cookie while they are still hot. Transfer them onto a wire rack to cool completely. Cover them using a plastic wrap with a small opening and keep in the refrigerator after the first day. Just to clarify, the cocoa powder is unsweetened, right? Looking forward to trying these soon! Hi Melanie! That’s right, we use unsweetened cocoa powder. Hope you love these cookies as much as I do. The cookies were a hit! Everyone I gave the most to absolutely loved them! Hi Melanie! So glad to hear that everyone loved it. Thanks for the feedback! Wow. These look delicious. 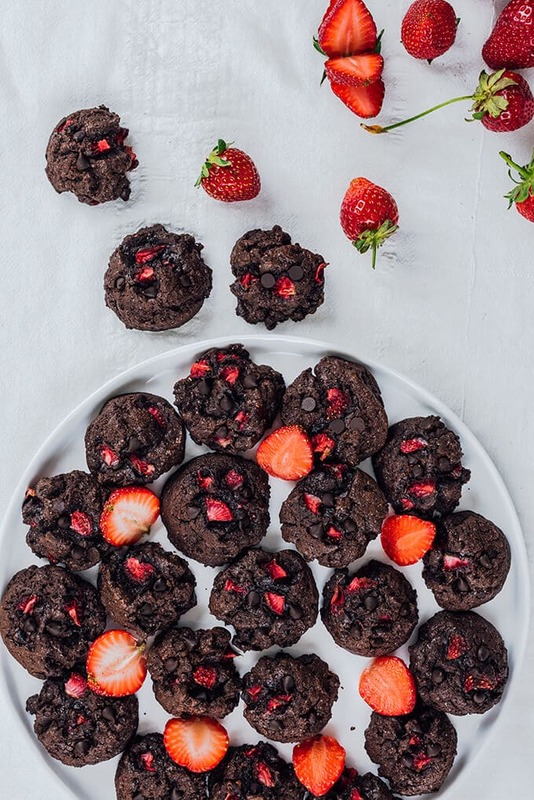 I didn’t realize until I read this that there are no choc strawberry cookie recipes around! I love soft chewy cookies. They’re the best. These look perfect. I’m going to try your recipe.